ACTPHAST 4.0 is a unique “one-stop-shop rapid prototyping incubator” for supporting photonics innovation in European companies, which is financially supported by the European Commission under Horizon2020. ACTPHAST will support and accelerate the innovation capacity of European companies by providing them with direct access to the expertise and state-of-the-art facilities of Europe’s leading photonics research centres (24 ACTPHAST 4.0 partners), enabling companies to exploit the tremendous commercial potential of applied photonics. ACTPHAST 4.0 provides the full spectrum of technology platforms ranging from fibre optics and micro optics, to highly integrated photonic platforms (7 technology platforms), with capabilities extending from design through to full system prototyping. ACTPHAST 4.0 has taken care to ensure that all European companies (big and small but particularly targeted at SMEs) can avail of timely, cost-effective, and low risk photonics innovation support. The aim is to capitalise on the extensive range of capabilities of ACTPHAST 4.0 partners to impact across a wide range of industrial sectors, from communications to consumer-related products, and life sciences to industrial manufacturing. The access of European companies to ACTPHAST 4.0 capabilities will be realised through focused innovation projects executed in relatively short timeframes with a critical mass of suitably qualified companies with high potential product concepts. Furthermore, through its extensive outreach activities, the programme will ensure there is an increased level of awareness and understanding across European industries of the technological and commercial potential of photonics, especially amongst the first users and “non-photonics” end users industries. 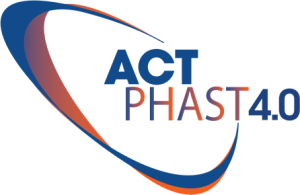 PCRL participates in ACTPHAST 4.0 in a three-fold manner: (i) as technology provider in photonics telecom, datacom and free space domains; (ii) one appointed member (Prof. Avramopoulos) in the Technical Coordination Team (TCT) of ACTPHAST and (iii) formal representative of ACTPHAST’s outreach activities in the area of Greece, Cyprus, Israel and Turkey.